Nothing beats the instantly satisfying smell and taste of fresh ground coffee, either for a quick boost in the morning or a pick me up during that mid-afternoon slump. Wanting a stylish and easy to use machine, the Melitta E957101 certainly provided style with its sleek design and black, gloss appearance which suits the majority of popular kitchen designs. Thanks to its small footprint, being only 20cm wide, worktop space is no longer compromised to make a superior brew. Ease of use was also high on the list of priorities, after all who wants to wade through menus and constantly have to read the instructions? A quick read through was enough to make the first cup of the day. Melitta recognizes that we all enjoy our coffee differently. 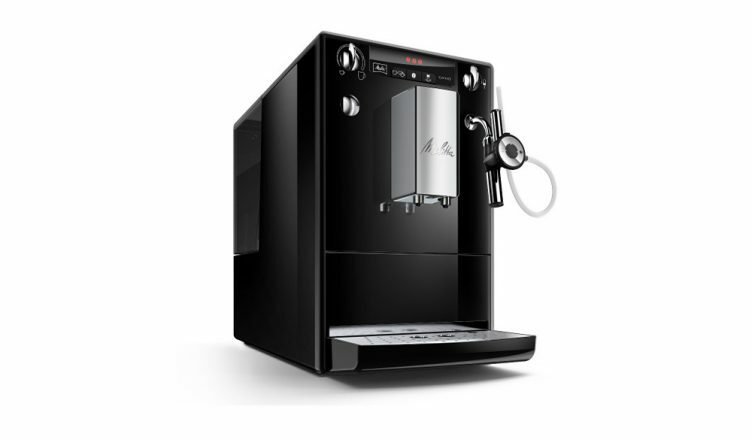 While this machine is designed for espresso and cappuccino, the variable controls allow you to easily set your preferred coffee strength and cup size – just pop the beans into the hopper, fill the water container and, once set to your favourite setting, off you go, quick and easy coffee on demand. This highly adaptable machine offers a fully adjustable height dispensing spout with two nozzles; enabling two cups to be poured at the same time with no more waiting around with the risk of the first mug going cold. One of the nicest features for me was the additional steam/frother nozzle which creates that frothy coffee look straight from the professional coffee shops and delivered to the comfort of your own home. An added bonus is that this lovely feature can also be used to warm milk as well. During use, the beans were ground quickly and, unlike others I have used over the years, not too loud! The water container is easily removed and it is simply a case of just lifting the lid and pulling upward. The cup platform is also removable for cleaning purposes and also enables you to wipe away the spent ground coffee. In fact, many of the parts are removable for ease of cleaning. The instructions at first sight may look complex, but are easy to read and understand, highlighting the individual settings and cleaning modes. To summarize, this is an excellent bean-to-cup machine offering a choice of espresso or cappuccino with adjustable strengths and height nozzles. Easily accommodating the use of various mug and cup sizes as well as a brilliant steam function for creating that authentic coffee shop sound and taste. This coffee machine is perfect for get-togethers where you can amaze your friends and guests with your new-found barista skills. What’s not to like? This product is available in-store for a demonstration or you can use our stellar click and collect service online.